The Liverpool Ranges are in the New England region of northern NSW, about 400 kilometres north-west of Sydney. Signed and dated l.l., watercolour "C.M/ 1837". Douglas Dundas., Art Gallery of New South Wales Quarterly , 'Conrad Martens', Sydney, Oct 1963, 161 (illus.). Hendrik Kolenberg, Look , 'Australian images from the past: whether rarely seen or familiar, these works move and delight us', pg. 24-27, Sydney, Apr 2005, front cover (colour illus., detail), 5 (colour illus.). 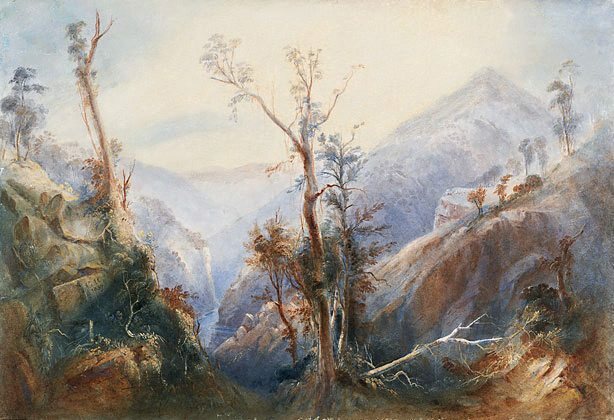 19th century Australian watercolours, drawing and pastels from the Gallery's collection , Sydney, 2005, 30 (colour illus. ).